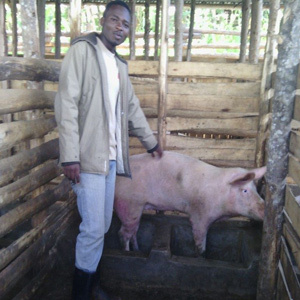 Joseph Macumi, 25, is employed as a vet at the Gatima Piggery. The business is owned by Jean Paul Gatima who was a Grow Movement client mentored by Emayeneme Gbemiye-Etta. Having achieved a secondary school diploma in veterinary skills, this was Joseph’s first job after graduation. He uses his salary to buy food at a local market, pay school fees for his brother and is currently paying for a wedding out of savings. Joseph and his family have a small portion of land which is infertile so he is proud that he can now contribute to improving their standard of life. He has used his salary to buy a cow so that his parents are assured of their wellbeing even after he moves out.